﻿ About Us - Is Mexico Safe?Is Mexico Safe? 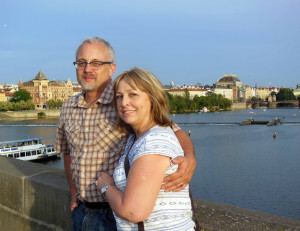 We are John and Linda Jameson and we made this website to promote the good news about Mexico. We see American television accentuating the drug problem and the violence. Those things do happen, but the majority of Mexico is safe, especially all the areas commonly visited by tourists. So we will track the news and also make reports on Safe Cities. We have been going to Mexico every year since 2002 and have NEVER felt unsafe. That year we visited the Mayan Riviera with our teenage daughter and one of her friends. We had a great vacation and ended up buying a timeshare. Next thing you know we have developed a business called MayanRental where we rent out luxury timeshares for owners that can’t use all the weeks they own. Mexico has been so good to us, we felt we needed to give something back. In addition to this website, we give at least 10% of our profit to Pasitos de Luz, an amazing organization that provides free services to kids in the Puerto Vallarta area with all sorts of developmental disabilities. We hope you enjoy the website. If you have a website or blog, please add a link to ismexicosafe.org to help people find more good news about Mexico. I am creating a website that will promote investing and living outside the United States and I am looking to bring articles and photos together. I would like to form an ongoing relationship with people such as yourselves that seem to have a real pulse on your area. What do I need to do to gain permission to print your articles on my site? The site will be Civvie as the magazine, Waypoint Intl as country information portal and Astute Trader as the investment side. I never saw this comment !! sorry. you may use any of this material on your site. a link back would be appreciated.